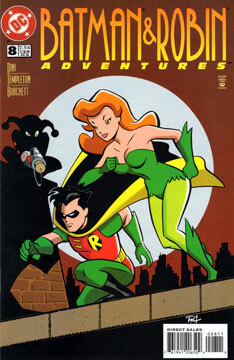 DCAU Comics » Harley and Ivy and… Robin? Harley Quinn attempts to free her pet hyenas, Bud and Lou, out of the zoo. Robin is there to stop her. But Poison Ivy has Harley’s back, and Robin is quickly under Ivy’s power due to her patented kiss. Batman soon realizes Robin is under thrall. Batman interrupts the new trio robbing a jewelry store. Ivy orders Robin to attack Batman, while the ladies make their escape. But Ivy trips over a hyena, and hurts her ankle. Robin immediately moves to help her, leaving a disgruntled Harley to deal with Batman. The trio make their escape. Back at the abandoned greenhouse, Robin tends to Ivy’s every need, and even improves Harley’s plans for a new robbery. This leads to a series of successful Robin-planned robberies. Batman has difficulty tracking them, as Robin is too well trained. Finally, Harley gets angry enough over the lack of attention to undo things. She tricks Robin into drinking the antidote. Once he comes to his senses, Harley attacks him in a fit of anger, just as Batman arrives. Ivy arrives, thinking Robin is still under her control, but he had consumed the rest of the antidote, and he tricks the gals and takes them down. Not gonna lie, this is one of my favorite issues! It’s hardly an Earth-shaking or thought-provoking plot, but all the elements are present for a good time in Gotham. The dialogue is spot-on. We get to see Batman as a detective. Harley and Ivy show what a dynamic team they make, working together and against each other. What’s not to love? I’d love to see this animated. Although, in a way, we did. This script shares a lot in common with Girl’s Night Out. This must have stuck in Mr. Dini’s mind. Rick Burchett’s fantastic art is another reason I love this issue. It’s darn near perfect. Everybody appears energetic and on-model. Nope! Anytime after Harley and Ivy would work. Harley has a casual outfit at the greenhouse, and Ivy shows up wrapped in towels.